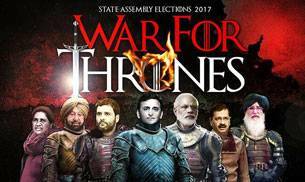 ExitPolls: BJP set to storm Uttar Pradesh, Uttrakhand and Goa. Congress in Punjab. Riding on a tsunami of support for Prime Minister Narendra Modi, the BJP seems poised to pull off one of the most spectacular victories in the electoral history of Uttar Pradesh. According to the post-poll analysis by Axis-My-India for the India Today Group, the BJP is projected to bag an astonishing 251-279 seats in Uttar Pradesh. Axis projects the Samajwadi Party and Congress alliance will get only between 88-112 seats, while the BSP is forecast to crash somewhere between 28-42 seats. The good news for the BJP extends to Uttarakhand, where it is projected to get a clear majority, bagging between 46 and 53 seats in the 70-seat assembly. The BJP is projected to emerge as the single-largest party in Goa as well, but could fall short of a clear majority. Axis projects the BJP could getbetween 18 and 22 seats in the 40-seat Goa assembly. Punjab and Manipur appear to be the silver lining for the Congress, with the party expected to form the government in both states. In Punjab, Axis-My-India projects that the Amarinder Singh-led Congress will be able to fight off a fierce challenge by the debutant Aam Aadmi Party (AAP). The Congress is projected to bag 62-71 seats in the 117-seat assembly. The AAP comes in as a strong second, securing between 42 and 51 seats. Axis projects a rout for the Akali-BJP combine, with their tally crashing down to between 4 and 7 seats. A deep dive into the post-poll study conducted by Axis-My-India suggests that the BJP has literally pulled Uttar Pradesh back from the brink. The last opinion poll done by Axis right between the first phase of polling in UP had shown the BJP sliding while the SP-Congress combine was in the ascendant. Before the first phase of elections, momentum favoured Akhilesh Yadav. However, the young CM seems to have been hard hit by a double whammy. The fact that Akhilesh Yadav did not disassociate with Shivpal Yadav and Mulayam Singh Yadav despite winning the battle for the cycle (SP's election symbol) and also that he allied with the Congress seems to have backfired against the chief minister. The Axis poll suggests that the Samajwadi Party may have been better off had it not allied with the Congress party and instead gone to the hustings alone, riding on the positive image of Akhilesh Yadav. Axis projects that the Congress will win only 10-15 seats out of the 114 seats which it fought, while the SP is by itself is projected to bag between 78-97 seats. BJP president Amit Shah's ticket distribution came in for much criticism from local party leaders in Uttar Pradesh. But if the Axis My India projections hold, Uttar Pradesh will once again prove to be a lucky hunting ground for the BJP's master strategist.After big defeats in Delhi and Bihar, Shah needs a resounding victory to prove why he's regarded as India's numero uno election strategist. One of the biggest reasons for a possible BJP sweep in UP, the poll data suggests, would be the consolidation of non-Yadav OBCs solidly in favour of the BJP. Non-Yadav OBCs seem to have felt neglected under the Samajwadi Party rule and their mass migration to the BJP is one of the key reasons for the BJP's strong showing. Axis projects that the BJP will bag 57 per cent of the Kurmi vote, 63 per cent of the Lodh vote and 60 per cent of the remaining non-Yadav OBC vote. Many of these communities voted for the SP in the last elections in large numbers, which was part of the reason that the Samajwadi Party had done so well in 2012. One of the masterstrokes of Amit Shah seems to have been the projection of Keshav Prasad Maurya as the state unit chief of the BJP in UP. His elevation seems to have helped convince the non-Yadav OBCs that they would have a key share of the spoils if the BJP won and that the BJP was serious about shedding its image as an upper-caste and trader-dominated party. If the exit poll numbers hold, Keshav Maurya would be the front runner to be the next chief minister of the state. The aggressive wooing of the Rajbhar community in Eastern UP and the alliance with the Kurmi-dominated Apna Dal also seems to have helped the BJP in its strategy to stitch a rainbow coalition of upper castes and non-Yadav OBCs.The vote share projections by Axis-My-India show that the alliance with the Congress does not seem to have helped the Samajwadi Party in any significant way. The SP-Congress alliance is projected to garner 70 per cent of the Muslim vote, which is roughly the same as what the SP was winning even without a partnership with the Congress. The alliance is expected to bag about 80 per cent of the Yadav vote, which is slightly more than what the Axis opinion poll had shown in December 2016. However, it seems Akhilesh Yadav was not able to translate his development work and youth appeal among other communities into a significant amount of votes. Despite his supposed appeal among the youth, the SP-Congress alliance trails the BJP in all age groups, including among the youth. The BJP is projected to bag 34 per cent of the youth vote while the SP-Congress is expected to bag 31 per cent of the youth vote. The BSP has been hard hit because, despite having the first-mover advantage when it came to seat distribution, Mayawati's party does not seem to have been able to add other communities to the BSP bandwagon. Mayawati has been able to hold on to its support among her own Jatav community. Axis projects that the BSP will bag 77 per cent of the Jatav vote. However, the BSP's hold over the non-Jatavs is slipping fast. Axis suggests that BSP will bag only 43 per cent of the non-Jatav vote share whereas the BJP is projected to bag a significant 32 per cent of the non-Jatav vote share. If the BSP's tally does indeed crash to 28-42, it would raise very serious questions about the survival of this Dalit party. Being out of power for two straight elections would make it difficult for Mayawati to hold her flock together. An analysis of the caste-wise break down of the Axis-My-India data suggests that demonetisation does not seem to have been a major turn off for BJP voters. The BJP is expected to bag 64 per cent of the Baniya vote. It's hold among upper castes remains strong. Axis projects the BJP will bag 55 per cent of the Kayasth vote, 62 per cent of the Brahmin vote and 62 per cent of the Thakur vote. Broadly speaking, these percentages of support are in line with the BJP's support amongst these communities even before the demonetisation bombshell detonated. It seems the negative perception about law and order under the Samajwadi Party rule far exceeded any negative effect DeMo may have had. Exit polls in the past have gone wrong and there is a possibility that the projections of Axis-My-India too could be off the mark. However, if these projections hold, this would be the first time since 1985 that any one party would have crossed the 250-seat mark in India's most politically significant state. In the then undivided Uttar Pradesh, ND Tiwari led the Cong to 269 seats in the 425 seat assembly. However, since the time Uttarakhand was carved out as a separate state in November 2000, no party has crossed the 224-mark, which was the SP's tally in the last assembly election. A victory as big as the one being projected by Axis-My-India would put the Modi-led BJP in the driver's seat ahead of the 2019 general elections. The pollsters have spoken. Now let's wait for the fat lady to sing.